The Financial Services Fellowship was an excellent experience for me. Having been born and raised in Portland, OR, I had never even been east of the Rocky Mountains in the U.S. It didn’t take too long to see the differences between NYC and Portland. NYC reminded me a lot of Shanghai and Beijing. I think the most important thing I learned on this trip was that NYC was a city I would love to visit as a tourist but would not want to reside in permanently. We visited a plethora of firms ranging from economic consulting funds to investment banks and to hedge funds. I saw a consistent theme in the advice each place gave us. People from many different backgrounds (and majors) are all well-suited for finance. In fact, most people jump from different positions in finance constantly. It seemed like most people we spoke to only held their positions for 4-5 years before moving on. Finance really desires diversity in experience. 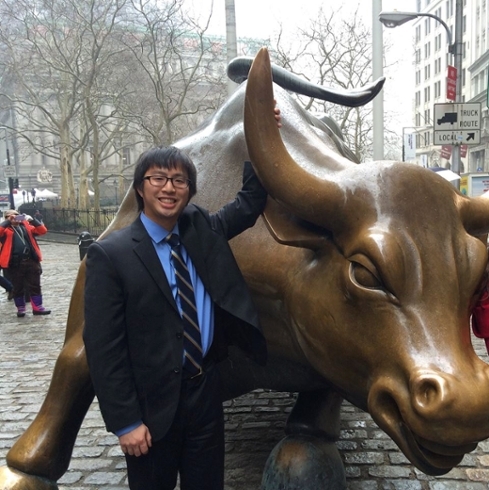 Overall, I think I could see myself in finance post-Reed, but not in NYC. I think the culture of “all work and absolutely no play” is a little too much for me. As much as I appreciate work ethic and ambition, there are other things in life I want to pursue that are outside of my career. Before the Financial Service Fellowship teed off, I was divided whether I wanted to go to grad school and do a PhD in Economics or work in the “real world” immediately after Reed. I was tilting towards the academia path but was concerned that the trip might just convert me over with all the extravagance that the world of finance is known for. Over the course of three days, we visited one financial institution after another; each serving a distinct role, all coming together to make one huge but intricate mosaic. It wouldn’t be unreasonable to generalize that everyone talked about the staggering number of hours they worked day in and day out and how little time they had for much else, especially for those who had just started out. The prize was obvious; the lavish dinners and all that accompanies with it. In conclusion, however, I realized that I wanted to opt for the higher education path instead. Jane Buchan helped me find a direction and was really understanding in her approach. I was concerned that there might be unknowing and unintended attempts to convince me to go in to finance from the people I met. However, at the end of every day, Jane and I would talk about my goals which differed from most members of the group and she would help me maintain my focus. All in all, it was a great trip and the final conclusion, to go for higher education, was a very surprising one but one that I am satisfied with. The Financial Services Fellowship was an excellent career development opportunity. For me, the best parts of the trip were the opportunity to meet people doing the jobs I would like to have and get a better sense of what their lives looked like, and to learn first hand what different aspects of the business entail. I already knew that I wanted to work in finance after graduation when I left for New York, but making in person visits to the offices of important firms made me completely certain that I want to pursue a career in the markets. I was able to get a much better sense for what a job in finance looks like on a day-to-day basis, which really drew me in and built up my excitement for a finance career. In addition, it really helped me solidify the steps of building a successful entry-level application. From delving deeply into the details of specific financial products such as CLOs and bond repurchase agreements with people who work with them every day, to visiting and discussing the culture and responsibilities with professionals across the full spectrum of finance, I felt I got a unique inside perspective from the trip. My understanding of the differences between asset managers, investment banks, private equity and investment consultants was significantly deepened by the opportunity to meet with industry professionals in person, giving me a much clearer picture of the different fields of finance. I highly recommend participating in the fellowship to anyone with an interest in financial markets.